Azure, on a fess embattled, counter-embattled Gules fimbriated Or between in chief three flowers of Cytisus Proper and in base a horse salient, a cross crosslet Argent, Debruised of a three point label. 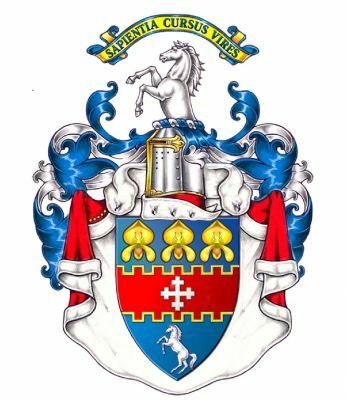 Crest: On a Wreath of the Liveries is set for Crest a Demi-horse Argent. Motto: SAPIENTIA • CURSUS • VIRES. Granted: Warrant signed 30th August 2004.